If you're planning a getaway to Disney World in Orlando Florida this summer, you're going to want to pack smart. Whether you're going with family, friends or a spouse, you'll want to be prepared for a variety of occasions, but definitely feel comfortable and casual. Once you have your park tickets, flights booked and make all the dinner reservations—deciding what to wear to Disney World is a whole extra challenge! Disney World is one of Florida's top vacation destinations, especially for families. There's tons to do and see—especially this year. You'll have to plan your trip around four major attractions: the Magic Kingdom, Epcot, Disney/MGM Studios and the Animal Kingdom—as well as the sports complex, resort hotels, restaurants, shopping, entertainment and activities... We could go on! No matter what your itinerary includes, plan to be on your feet a lot, and be prepared for heat! Florida is warm year-round, but you can also run into rainy afternoons and thunderstorms (so check out the weather guide for travel tips). 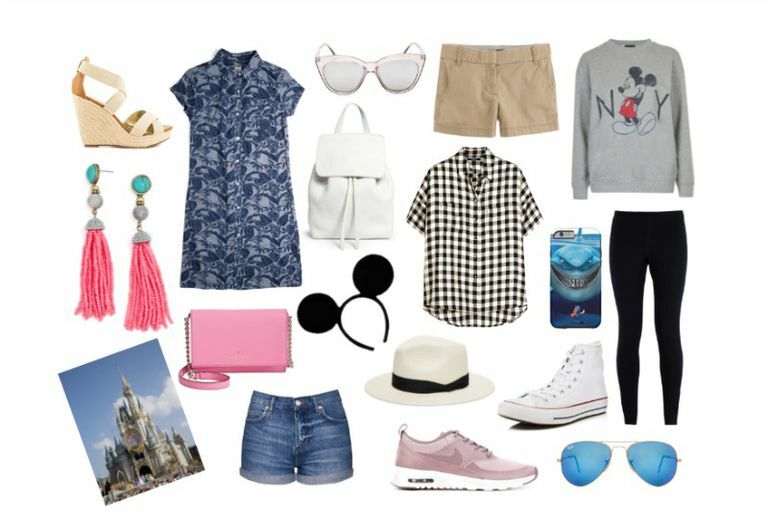 In the guide ahead, we've got fun and cute outfit ideas for a long weekend at Disney World that can be mixed and matched to be worn over and over. 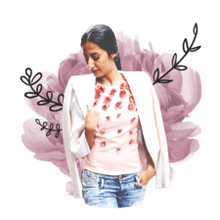 For more outfit ideas, check out Refinery 29's Disney theme park slide show, and for more mom style tips, check out PopSugar. Need More Vacation Tips For Walt Disney World? Whether you're flying or road-tripping down to Orlando, comfort is key for travel. We suggest getting cozy in a pair of sleek black leggings, and wearing cute sneakers, like a pair of Converse high-tops. Get into the festive spirit with a Disney-inspired sweatshirt, and wear your sun hat so you don't risk crushing it in your luggage. We suggest: Old Navy compression leggings, Disney Minnie Mouse sweatshirt, Converse Chuck Taylor All-Stars, Panama Hat. If your first day at Disney World will revolve around places like Epcot Center and The Magic Kingdom, don't forget the mouse ears! Between riding the rides, walking around and getting a fair share of sunshine, definitely opt for shorts, sneakers and a lightweight top so you can be comfortable all day. Store all your belongings in a easy-to-carry backpack and throw on some fun, reflective shades for your best Instagram selfies. We suggest: Nike Air Max Thea, J. Crew shorts, J. Crew gingham shirt, faux leather backpack. SeaWorld, Star Wars—whatever you're into, you can find it in Orlando. For your second day of exciting activities we recommend a fun printed shirtdress in a breathable fabric. This midi-length shirtdress from Bridge & Burn is long enough to feel covering and comfortable enough to wear on rides and walking around all day. A wide-brim straw hat will keep the powerful sun off your face and a playful Finding Nemo phone case will infuse your outfit with a little bit of that Disney magic. We suggest: Bridge & Burn dress, faux leather backpack, Converse Chuck Taylor All-Stars, Panama Hat. For a night out to dinner in the Magic Kingdom, just transition your daytime dress with a pair of summery wedges and some fun earrings. A sweet little crossbody bag in a bright color is perfect for toting just your necessities and giving yourself a break from that bulky backpack. We suggest: Bridge & Burn dress, BaubleBar tassel earrings, Kate Spade bag, Lauren Ralph Lauren wedges. Still have energy? Dress up for another exciting day at Disney World in a pair of relaxed and comfortable denim shorts and cool kicks. A loose printed shirt will keep you (relatively) cool and your trusty crossbody bag is great for packing your tickets, phone, wallet and keys all while being hands free for hand-holding, excited pointing and of course, waving wildly as you fly down the roller coaster track. We suggest: Kate Spade bag, Nike Air Max Thea, Ray-Ban aviators, J.Crew gingham shirt, Joe's Jeans shorts.